Walgreens (aka “Wags”) can be a little intimidating to a new couponer. It can be more complicated to coupon in than other stores because there are several reward systems. At the same time, once you learn the rules, it can be a fun, challenging, and rewarding place to coupon. Now, I do have a soft spot for Walgreens, because it was the first store that I learned how to coupon in. I didn’t know it at the time, but it wasn’t the easiest way to learn couponing. However, once I learned and mastered its rules, all the other stores seemed very easy in comparison. 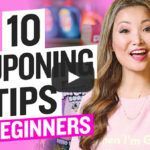 My goal with this guide (and video) is to explain the different aspects of coupon rules at Walgreens. Hopefully, after reading (or watching) this guide, you’ll have a much better understanding of Walgreens. And with some practice, I promise, it’ll become easier. Register Rewards (RR) is the older of the two reward systems. You do not need a membership card to participate. They are dollar off coupons that prints at the register in return for purchasing certain items. The items that RR will print for and values of the RR printing vary week to week, and you can find that information in the weekly Walgreens ad. The best part about these coupon is that they are not tied to a specific item. That means it’s a certain dollar amount off of your purchase. It’s not “$2.00 off Crest toothpaste” but rather “$2.00 off your purchase.” The coupon isn’t tied to a specific product so it can be used on any future transaction. It looks like a Catalina, which is a coupon that prints on receipt paper and given to you by the cashier with your receipt. In fact, it is a manufacturers coupon operated by the Catalina company rather than Walgreens. If an RR doesn’t print, you contact the Catalina company to get it reissued. You can do this by calling 1-888-8-COUPON (888-826-8766) or filing a claim here online. RRs, like a Catalina coupon, have an expiration date of 14 days from the day it was printed. The Points, or formally known as Balance Rewards System, are associated with your account. You can earn points and redeem them to pay for future transactions. To start earning points, you must sign up as a Balance Rewards member. It is free and easy to do. You can sign up online here, in stores, or through the Walgreens mobile app. To earn points, you simply enter your phone number at checkout. You can also use the physical card or the barcode for your card on the mobile app. I recommend associating a phone number to your account for quick access. While RRs have a 14 day expiration, points last much longer. They expire 1 year (12 months) after they are earned and you must shop at least once every 6 months to keep your account active. If your account goes inactive, your points will disappear!. Every 1000 points is roughly equivalent to $1. You can redeem points at pre-determined dollar levels. You can redeem at $1, $2, $3, $4, $5, $10, $20, $35, $50. The higher the level, the better value for your points. For example, you need only 40K points to redeem $50, instead of 50K points. If you wait to redeem 40k points at once, it means every 1000 points, is worth $1.25 instead of $1.00. You can see how many points you’ve earned on a transaction by looking at the bottom of your receipt. You can also see your total point balance at the bottom of your receipt. You can access your point balance and point history by logging into your account on Walgreens.com or from the Walgreens mobile app. Did you know you can even earn Rewards for participating in certain activities? Yes, you can! Earn points to spend at Walgreens by doing easy things, such as walking, quitting nicotine, exercising daily, linking a device, and more! This is called Balance Rewards for Healthy Choices. Read about it here. If your rewards are not issued, you can contact Walgreens customer service here to get them credited to your account. Now that you know how the rewards systems work, let’s get to the meat of couponing at Walgreens! This is the part that tends to confuse people, so go through it a few times if you need to. Once you become familiar with these rules, I promise you it will become easy, just like learning how to drive. There is a limit of 1 RR printed per offer per transaction. For example, if toothpaste has a RR on it and you buy two toothpastes in a transaction, then it will only print one RR. The Solution: If you want to buy multiples, you would split the products into multiple transactions. For example, if you wanted two toothpastes, then you would purchase them in two transactions to receive two RRs. However, if you are buying other offers that are producing RRs, then you can purchase them in the same transaction. For example, if you want to purchase toothpaste and a can of soup that have separate RR offers, then you can buy one toothpaste and one soup in the same transaction and have two RRs printed, one for each. If you use the RR to pay for the same item that produced that RR, no new RR will be printed. For example, if you buy a toothpaste that is producing a RR in the first transaction, then you can’t use it to pay for another identical toothpaste in the next transaction because the RR for the second transaction won’t print. The Solution: You spend the RR on other items besides the item that earned the RR on. You can use it on other RR promotions, on promotions producing points, and on clearances. For example, if a can of soup is $1.00 and is printing $1.00 RR and toothpaste is $1.00 and printing $1.00 RR, then you can buy the toothpaste in transaction one and earn a $1.00 RR. Once you receive the $1.00 RR from transaction one, then you can pay for soup in the next transaction and still get the $1 RR from the can of soup. The Exception: There is an exception to this rule. Every few months, some RR promotions will print RR even if you use RR from a previous transaction to buy the same item in a new transaction. This is what we refer to as “Rolling”. When you hear couponers say “this is rolling”, that’s what they mean. We can never predict when this happens or for how long it will happen. Usually people discover it by accident or by testing and often Walgreens puts a stop to it rather quickly. To be safe, stick to the rule. Walgreens does allow you to redeem Points on unit offers (such as “Buy 2 Get 2000 Points”) and still earn Points on these offers. This is actually good, because most of the weekly Points offers are unit offers like this. However, if you redeem Points to pay for a threshold offer (such as “Spend $15 Get 3000 Points”), you cannot also earn Points in that transaction. This, also, applies to Point boosters and special promotions to earn bonus Points. The Solution: If you are doing a threshold offer in a transaction, do not pay for that transaction with Points. While RR has a limit of one print per transaction, there are no explicit limits on how many Points you can earn. For example, if shampoo is producing 1000 Points for every bottle I buy, I’m not limited to buying one bottle per transaction. You can buy two bottles in one transaction and earn 2000 Points. The total number of manufacturer coupon cannot exceed the total number of items in a transaction. I call this the “Coupon to Item Ratio”. Walgreens coupons do not count towards this limit. Example, if you have two items in a transaction, then you cannot use more than two manufacturer coupons. You can, however, stack Walgreens coupons with the manufacturer coupon. RRs are considered manufacturer coupons. If you are buying two items and you have two manufacturer coupons on those item and one RR, that counts as three coupons. You will need to add one more item to meet the Coupon-to-Item Ratio, if you want to use the RR. Cheap items you find in stores; Example: Candy by cashier, pencils, etc. Inexpensive sale items you don’t have coupons for from weekly ad; Example: Tomato sauce for $0.50, milk, or cheap eggs (they have them on sale for around $1 periodically), etc. Remember that filler items should be less than the value of the RR you want to redeem, ideally as cheap as possible. So, if you have a $0.50 filler item to redeem a $2.00 Register Reward, you’re only getting $1.50 net deducted. As of the coupon policy update in 2014, Walgreens is no longer accepting coupons that’s value exceeds the price of an item. For example, you can’t use a $1.00 coupon on an item that is $0.99. The cashiers used to be able to adjust the coupon value down to $0.99 but now you can no longer use that coupon at all, even if it’s just a penny over. In a Buy 1 Get 1 Free sales, you can no longer use a coupon on the free item. So in a Buy 1 Get 1 Free situation, you can only use one coupon. Similarly, you cannot use a bogo coupon on a bogo sale. They want you to pay for at least one item. If you want to use a bogo coupon during a bogo sale, you could buy 4 items and use one bogo coupon during the sale. There are things called umbrella promotions, such as P&G promotions, that require you to spend a certain amount of money to earn a reward. It may be something like “Spend $20 on P&G products, get 5000 Points.” To get the reward, you must purchase everything in one transaction because your purchases aren’t tracked (like at CVS and Rite Aid). Also, you must buy over the minimum at Walgreens. If the minimum purchase is $20, you have to spend $20 or more (pre-tax) on the products that are a part of the promotion. This is contradictory to the 98% rule at CVS. Walgreens coupons are special coupons because you only need one, even if you are buying multiple items that the coupon applies to. Walgreens coupons are also known as IVCs – Instant Value Coupon or Instant Value Code – because the cashier can enter the code instead of scanning the barcode. With IVC coupons, you only need one and it will automatically apply to all the applicable items in your transaction. For example, if you have a $1.00 off Walgreens coupon on one box of kleenex and you buy 3 boxes, then only one Walgreens coupon need to be scanned. Often, I don’t even clip the coupons. I just hand it over to the cashier to be scanned. Additionally, you can stack multiple Walgreens coupons on the same applicable item. For example, if there’s a coupon in the weekly ad and another in the monthly coupon booklet, you are allowed to stack them. Walgreens does offer rain checks! If sales items are out of stock, you can request a rain check. These are valid for 60 days after being issued. Sometimes, managers may choose to substitute a similar item at the same price rather than issue a rain check; it is up to your store. Until 12/31/2017, you get 10 points for every $1 spent at Walgreens. Details here. If you have a problem with a cashier, it’s best to try to resolve it in-store with the manager on duty. If that is not possible, you can also try to contact Walgreens customer service. There are a few direct numbers you can call to get assistance depending upon the issue you’re having. Are you a visual learner? Click here to watch videos of my explaining past Walgreens deals. Hello Tina, I am a little bit confused in regards to the digital coupons on the Walgreens website. Some of these coupons seem to be Walgreens coupons and some are manufacturer coupons. How do I know the difference? Because if I clip an MQ to my card, then I can’t use a printed MQ with the same item, but if I clipped a Walgreens coupon to my card, then I can use the paper coupon as well. So, is there a way to tell which coupons are MQ and which are Walgreens coupons on the Walgreens website? Also, I have one more question. some of the coupons on their website are allowed for one use only. So, after you use it once, it is no longer clipped on your card. But if the same coupon is in the monthly booklet, can I still use that same coupon by scanning it during checkout? Hello there. I have a question pertaining to the digital Walgreens coupons found on their app. Can you use one coupon for more than 1 quantity of the product? Basically I want to know if I can only buy one quantity of what the coupon is for or will the coupon apply to more than one quantity? The digital coupons from Walgreens apps that at Manufacturer’s coupons are one time use coupons on one item. If you use Walgreens coupon (from app or from Walgreens monthly coupon booklet), one coupon scan will apply to multiple items in the same transaction. Just need to scan Walgreens coupons once. i was wondering if i could use points on a promotion of buy 2 toothpaste get 4000 pts. Will i still get my points if i use poinst in this scenario? Thanks for your hard work! Hey Jessica, when you need to buy a certain amount of items to earn points (Buy 2 Get Back 4000 Points), you can use points to pay and still earn points. If you have to spend a certain amount (Spend $15 Get Back 4000 Points), you would not earn points if you use points to pay. Hope this helps! I would like to know if I can roll my points. For example, transaction #1, I earned 3,000 points after payment, Then I will do my transaction#2 in which, I will use the 3,000 points I earned from transaction #1 in addition to my payment to complete my transaction #2. Note, I will be earning 5,000 points for my transaction#2. Hey Janice, if the points you are earning in the second transaction are from a threshold offer (spend $10, get back 5000 points) then you won’t earn those points if you use points to pay. If the second transaction is a unit offer (buy 4 get back 5000 points), then you can roll your points. Hope this helps! Yes, this is helpful. Thank you for this info. Whew. I need a class on Walgreens. CVS is easier! I have a question. I had 2 of the RR coupons. I think both issued by P&G. One was for $3 off purchase and the other for $5. I checked out and was only buying one item. I had planned to stack them. The cashier said they are considered mfr coupons (you state this above as well). For that reason, I was only able to use one of the coupons. However, had I purchased two items would I have been able to use both coupons in the same transaction? Hi Antwanika! Yes, had you purchased two items, you would have been able to use both. Hi Joelle! If a product at Walgreens is buy one get one free, you can only use a coupon on one of the items. For example, Detergent is buy one get one free. You have a coupon for $1/1 detergent. You can only use one coupon. Same scenario, except your coupon is $1/2 detergent. To use the coupon, you would need to buy 4 detergents. 2 you will pay for (and can use a coupon on) and 2 will be free. Hope this helps! Gee it is much simpler to shop @ rite aid with their system of coupons & rewards !! Hi Roger! lol…some stores do seem easier until you get used to the rules. Hi Pam! You would pay $1.26 for the gum. You would then get back $1.26 in Register Rewards. You can use that on a future purchase. Register Reward points do not “roll”, meaning you can’t use them on the same item you received them from and still earn more Register Rewards. If you used them to pay for another gum, you could, but you wouldn’t earn any more Rewards. It’s better to use your Register Rewards on something that doesn’t generate Rewards. Hope this helps! walgreens has a buy 2 colgate recieve 4000 points if you pay i with points do you still get the 4000 points? Hi Esmeralda! For deals that are unit offers (Buy 2 Get 4000 Points) you can use points and still earn points. For threshold deals (Spend $15 Get Back 3000 Points) you cannot use points and get back points.